There is saying that your attitude determines your altitude. 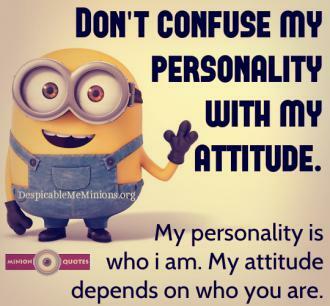 Attitude accounts for even more. There once was a crow. He was a happy crow until one day he saw a swan. "You are so beautiful," he told the swan, "If only my feathers were white, I would be the happiest bird." The swan replied, "I have seen the parrot who lives in that faraway tree. He is surely the happiest bird in the forest." The crow flew to the faraway tree and saw a stunning parrot. "If only I could have plumage like yours, I would be the happiest bird." "I have seen the peacock that lives in the zoo past the edge of the forest. He has so many colors that people gather each day to see him." replied the parrot. The crow flew past the edge of the forest to the zoo. He saw the remarkable peacock. It was near the end of the day and people were leaving, so the crow visited with the peacock. "When people see me, they shoo me away. You are so spectacular that they line up to see you. If I could look like you, I would be the happiest bird." "Because of my beauty, I am here in a cage." began the peacock, "You are the only bird that is not caged." If I could look like you, I would be free. I would be the happiest bird." Being successful and not being happy is NOT my idea of success. Financial well being is only a small measure of success. If you are not as happy as you would like, try an attitude adjustment. Giving also makes you happy. When I have something important to share with my wife, I hold her hands in mine. That way she cannot hit me. By all means marry: If you get a good wife, you'll become happy; if you get a bad one, you'll become a philosopher. I don't feel old - I don't feel anything until noon. Then it's time for my nap. My friends, I thank you for reading. which is my newest site. The site is under construction, but there is already a lot of help and information that is available.